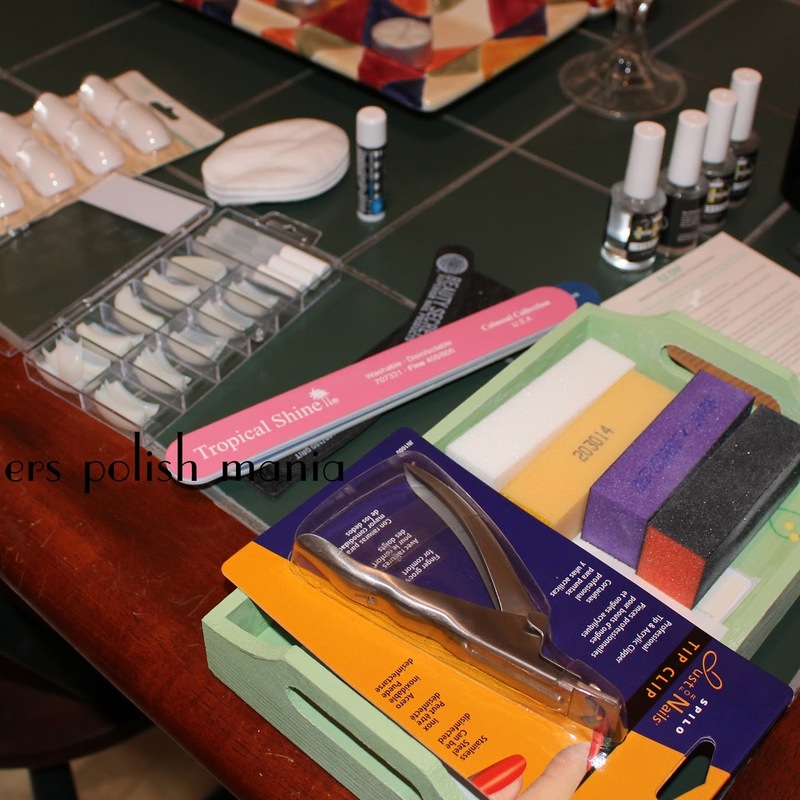 fingers polish mania: I can so be flashy! While I type this, the hurricane is raging fierce outside! I've got my tub full of water just in case! I do NOT follow the old adage, "if it's yellow, let it mellow". You know who you are out there!! I guess you now know that I wrote this post way before you see it. It happens. Get over it! My blog, my rules remember? I just hope the power doesn't go out. I hate that! Last night, I was having an email conversation with a blog friend of mine. And she said that I'm not flashy when it comes to nail polish. I'm not gonna name names-she knows who she is!! HAHAHA! At first, I was a little appalled and offended and believe my response was, 'them's fighting words!' But the more I thought about it, maybe she is right. I don't do glitter so I guess technically no I'm not flashy. 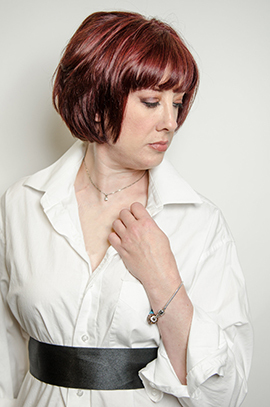 But I was determined to try something different today to prove her wrong. 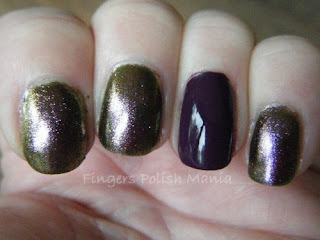 Here we have Orly Space Cadet and Orly Plum Noir. These bottle shots were taken outside in the hurricane on my window shutters. I think it's a pretty cool look. Check it out, my camera kept the purple as purple! How cool is that! Plus wow what a freakin' awesome bottle shot eh? To me, Orly Space Cadet is a little scary. It is a heavy shimmer and may even cross over into glitter land. Which I am freakishly against. Maybe I suffered a glitter accident as a little girl. Who the hell knows! But Orly Plum Noir is one pretty purple creme. I have seen recently, people doing an accent nail in the opposing color and thought these two would go really well together. I tried outdoor shots, but again, Irene is not helping. 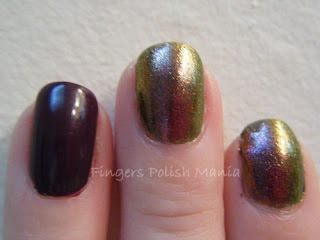 As you can see, Space Cadet is a rainbow of pink, purple, gold and green. If it had been sunny, it would really have been something. 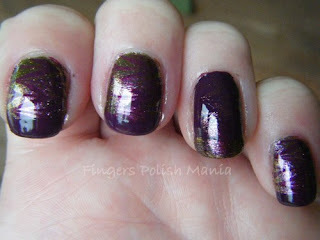 The Plum Noir is probably my favorite purple polish so far. It just is. 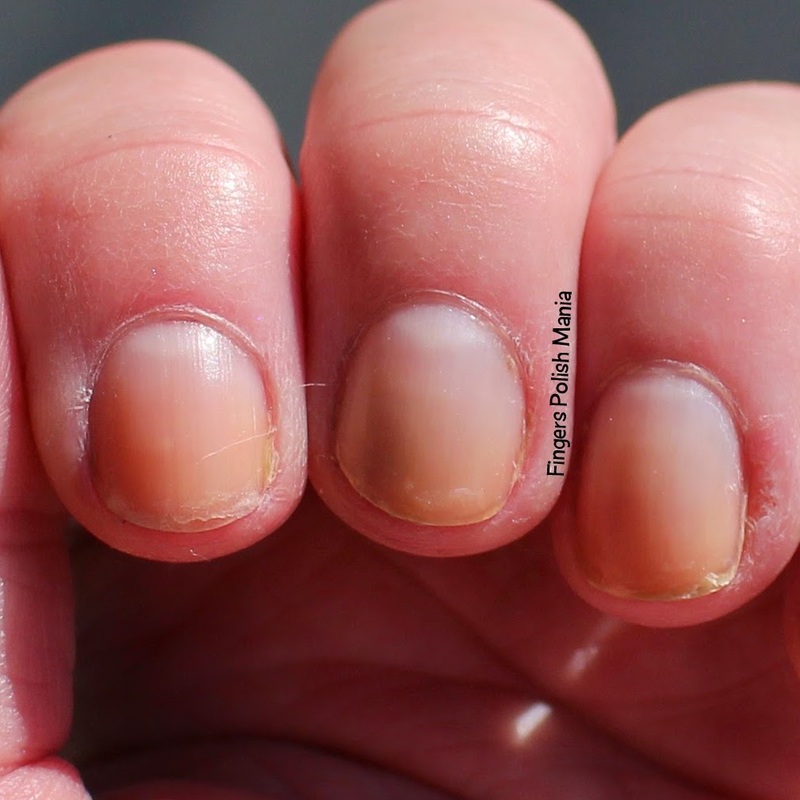 You can also see that on my ring finger I did the contrast color. 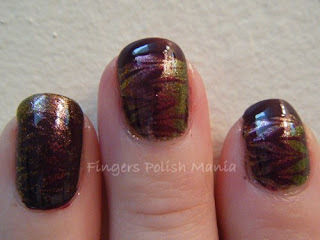 So when I stamped with plate M 78, I used the opposite color. It actually is really hard to see. So I am letting you know ahead of time. 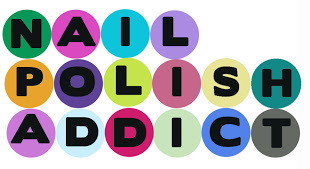 So I'm going to use this stamp again for my next mani and you'll be able to see it better. It looks much better in person. You can hardly see my funky french in these. I have to admit that I am liking this Space Cadet. It shimmers with so many different colors. 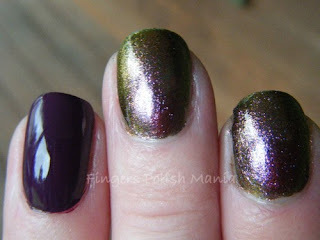 While I don't think it has changed my mind about going to the glitter side, I am digging the flashiness of this polish. So I guess my friend was right in saying that I'm just not flashy. What do you guys think?? I wish my camera stayed true to polish colors! I have taken some photos of light blue and it doesn't hold its color! I just bought Orly Space Cadet and I am so excited to try it after seeing it on your nails! Love the funky french! I can see the design perfectly in the photos! I really like how shimmery the Space Cadet is. I love Space Cadet! It's such an awesome color. So unique! @Nail-venturous- usually my camera makes purples more blue-i just got lucky! @Sandra- Yes I'm determined to make fun of the bottle shot! @Laura-I know you have it!! @destany-it really is a cool polish! I am so in love with Space Cadet. It was the first Orly I ever got! Great pics! @Carly- my first Orly was the matte Suede blue! I think it looks great! !1 I told ya...gonna get you to the glitter side eventually, we are one step closer!! LOL. The stamp almost looks like a marbled effect. Looks great! Space Cadet is one of my favorite polishes... looks great!!! I'm glad you got brave to try it :-P ... 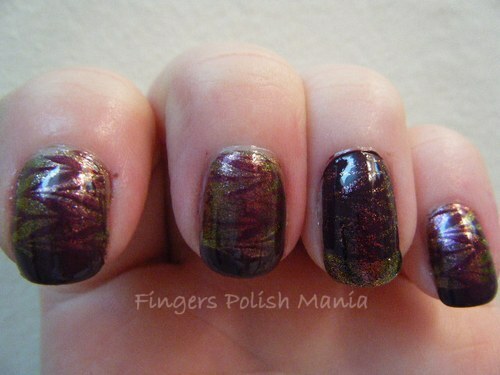 I like how the stamping looks, as usual your rocking the funky french!!! 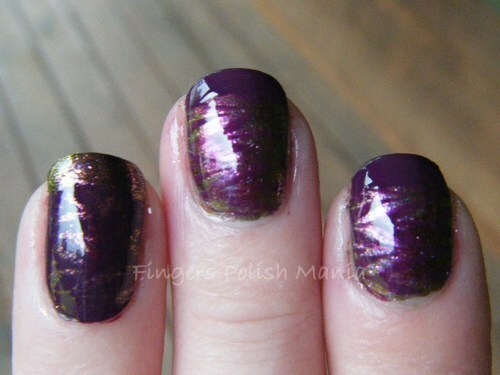 Actually, I like the subtle effect of this mani. I love this mani- Space Cadet is soooo pretty!! @Kimberly- I usually am the queen of subtle! @Emily-yes I really like space cadet! Well, if Space Cadet scares you, I think that does mean you're not flashy. :) I am perhaps too flashy when it comes to nail polish (not enough glitter as a child? reaction to working in a very conservative office for too long? who knows). @KarenD- you always make me laugh! 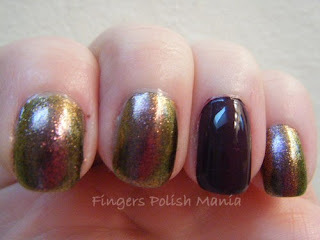 Polish Amor is determined to get me over to the glitter side! It's her mission in life! 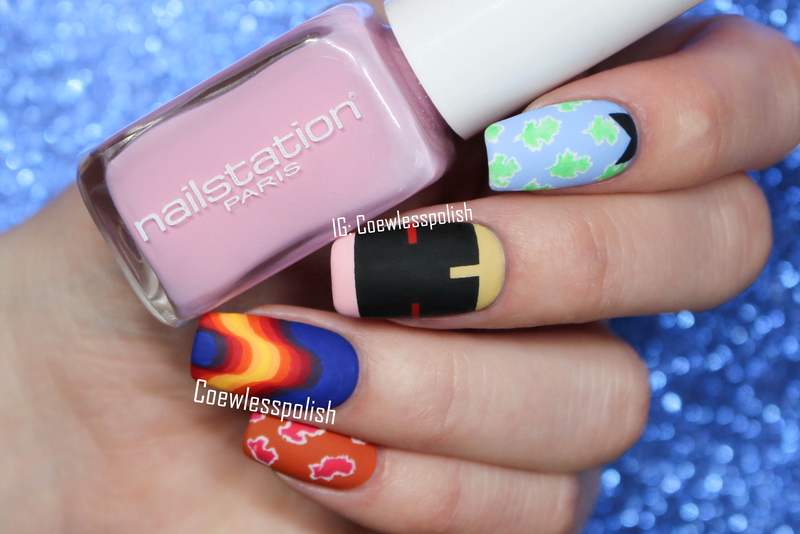 This is a really fun mani! Hope you made it through the storm OK! Space cadet is gorgeous I'm glad you tried it.